Hoop earrings are pretty much the perfect accessory--they look great no matter how dressy or casual an outfit and there are tons of different styles to choose from. I recently picked up a pair of classic silver hoops, which sparked a need desire to add even more to my collection. 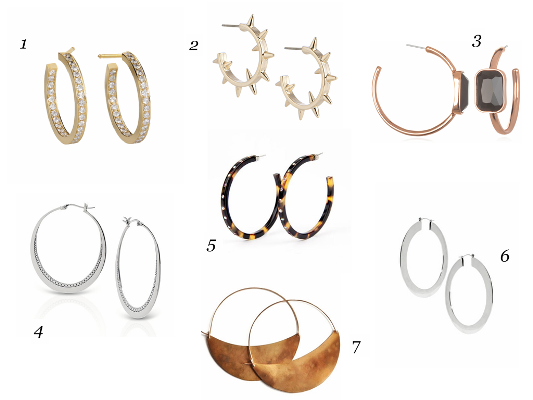 Here are a few pairs that have caught my attention, including a pair of yellow gold and diamond hoops from Cartier that will, sadly, remain in my hoop dreams for now. I love wearing hoops! I used to wear them all the time in high school and college. I've been looking for the perfect gold & silver pair (i wore my silver ones sooo much I broke them :0( boooo). Until I find them, I'll settle for my costume ones. Oh well. Oh I really love #7! Caaauuute! I'm obsessed with #7 myself...like, REALLY obsessed! In my opinion, you can NEVER have too many hoops! Especially gold ones!